* The Medigap data in this table exclude group Medigap policies (which are included in the employer‐sponsored category). Overall, approximately 4.2 percent of Medicare beneficiaries are enrolled in group Medigap policies. The estimated total Medigap enrollment based on the MCBS Access to Care file is slightly higher than than the estimated enrollment based on ASPE’s analysis of NAIC Medicare Supplement Insurance Experience Exhibit data (9.68 million vs. 9.59 million, respectfully). 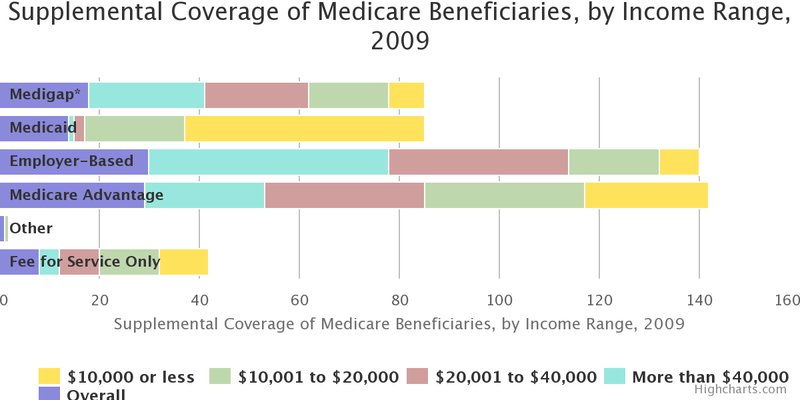 The MCBS data are based on the “always‐enrolled” population (i.e., beneficiaries who were always enrolled in Medicare Part A and/or B for 12 months); conversely, the NAIC data are based on the “ever‐enrolled” population (i.e., beneficiaries who were enrolled in a Medigap plan for at least one month during the year), and exclude data for companies that are regulated by the California Department of Managed Health Care (DMHC). Copy this code to clipboard and place it on your web page.